TMS has reported news and research in the minerals, metals, and materials fields since 1949, with publication of the first issue of Journal of Metals (now JOM). Today, TMS publishes six technical journals and is internationally respected for its coverage of important science and engineering developments across a wide range of disciplines that impact work in industry, academia, and government. TMS Members: Log in to this website for free electronic access to the full library of TMS published journals, including decades of archived articles. Not a Member? Visit the TMS membership home page to find out how you can start accessing free TMS journal content and other benefits. JOM explores the full range of minerals, metals, and materials science and engineering to represent all interests of the TMS membership, including extraction, characterization, processing and fabrication, design, applications, industrial and manufacturing developments, resource and supply chain issues, and life-cycle and sustainability practices. In fulfilling this scope, JOM strives to balance the interests of the laboratory and the marketplace by reporting academic, industrial, and government- sponsored work from around the world. 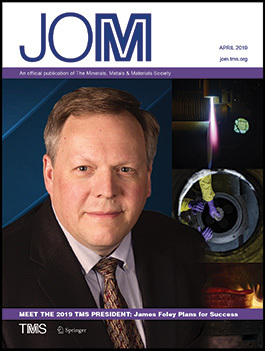 As the member journal of TMS, JOM includes a magazine section devoted to member and TMS-related news, which is separate from the technical journal content. Integrating Materials and Manufacturing Innovation (IMMI) is a peer-reviewed publication that explores innovations from the discovery of materials through their manufacture in support of the practice of Integrated Computational Materials Engineering (ICME). You are leaving the TMS website. TMS Members: To read a TMS journal for free, you will need to return, log in, and access the journal through the TMS website. Published in partnership with the Institute of Electrical and Electronics Engineers (IEEE), the Journal of Electronic Materials (JEM) reports on the science and technology of electronic materials while examining new applications for semiconductors, magnetic alloys, dielectrics, nanoscale materials, and photonic materials. The journal welcomes articles on methods for preparing and evaluating the chemical, physical, electronic, and optical properties of these materials. Specific areas of interest are materials for state-of-the-art transistors, nanotechnology, electronic packaging, detectors, emitters, metallization, superconductivity, and energy applications. The Journal of Sustainable Metallurgy (JSM) is a quarterly publication dedicated to presenting metallurgical processes and related research aimed at improving the sustainability of metal-producing industries, with a particular emphasis on materials recovery, reuse, and recycling. Coverage also includes novel metallurgical processes and related research that lead to operations of a smaller environmental footprint. In addition, the editorial scope encompasses new techniques, as well as optimization of existing processes, to include utilization, treatment, and management of metallurgically generated residues. Articles on nontechnical barriers and drivers that can affect sustainability will also be considered. Jointly published by TMS and ASM International, Metallurgical and Materials Transactions A and B are highly respected, peer-reviewed archival journals for metallurgy and materials science. Metallurgical and Materials Transactions E: Materials for Energy Systems, was published from 2014 through 2017, with all issues archived on SpringerLink. This monthly publication focuses on the latest research in all aspects of physical metallurgy and materials science, and explores relationships among processing, structure, and properties of materials. Publication interests encompass the main topics of alloy phases; transformations; transport phenomena; mechanical behavior; physical chemistry; environment; welding and joining; surface treatment; energy materials; magnetic materials; solidification; materials processing; composite materials; biomaterials; and light metals. A bi-monthly publication, this journal focuses on process metallurgy and materials processing science. Coverage emphasizes the theoretical and engineering aspects of the processing of metals and other materials, including studies of electro-and physical chemistry, mass transport, modeling, and related computer applications. TMS Members:You have free electronic access to 20 materials-related journals, offered by TMS’s publishing partner, Springer. TMS is one of the two Sponsoring Societies (with ASM International) that supported the formation of Acta Materialia in 1953, and is now considered a Cooperating Society for the Acta journals. Cooperating societies are technical or professional societies that have been approved by the Acta Board of Governors. These societies have agreed to assist with development of the Acta journals and other corporation activities by offering candidates for the Acta Board of Governors. The Acta Board of Governors, which consists of fifteen total members, of which six are Sponsoring Society members and four are Cooperating Society members, establishes the operating procedures and policies for Acta Materialia, Inc. and oversees the publishing of the four Acta journals: Acta Materialia, Acta Biomaterialia, Scripta Materialia, and Materialia. The Acta journals are not among those offered as a free TMS member benefit. For additional information on TMS journals, contact publications@tms.org. For questions regarding TMS member journal benefits, contact membership@tms.org.